de Jong Dream House: Here come the counter tops. I was happy to see the counter installers in the house today. The two guys on the crew are from Serbia, so we had a nice chat about being bi-national in Ohio. I was a little disappointed that my quartz kitchen countertops and in-law bath have to wait until Monday, but since we want to make sure the correct holes get drilled to match the correct fixtures, I've made my peace with the delay. On the happy news, the counters in D's bathroom, our bathroom and powder room are in! 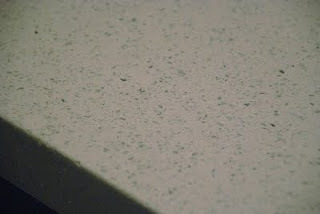 As a review, we choose eased edge profile, 1/8" radius corners, and negative reveals on the undermount sinks. If these terms are foreign to you--and they sure were to us before this process!--click here for pictures and an explanation. We also chose polished finish, which may have been a mistake because it is shiny instead of matte, but it's also easier to maintain and much more common, so we'll see how it goes. Here's the Venetian Gold granite remnant in D's bathroom. It's a little busy for me, but great for his bathroom. Here's a close up of the sink. Ignore the camera shadow to the left, it's not dark like that in real life. (This is the negative reveal, meaning you can't see the top of the sink. We like it because gunk can't collect there). This is a photo of the remnant on the day we selected it. Here is the Kashmir White in our bathroom. This is the only granite for which that we couldn't use a remnant. Looks great with the gray wall. Picture with our slab on selection day. Granted, we didn't look at it very long. We saw that it was a whitish remnant in the size we needed. Both the designer and saleswoman told us that this is a higher grade granite, so we picked it. So I shouldn't be too surprised to see this. I'm still not sure how this is the same remnant, but it is pretty and looks nice in the powder room. Of course, we love the remnant price. I'm a little concerned that it's too busy for me with my vertigo issues, so I'll double check with Canton Cut Stone. Worse case scenario, on my bad days, if it bothers me, I can use the in-law bathroom downstairs. River White in the in-law suite. I LOVE this granite. If the remnant would have been bigger, I would have put it in our bathroom. Citadel Warp (5882) Formica laminate in the laundry room. I really look forward to seeing how this all looks together. 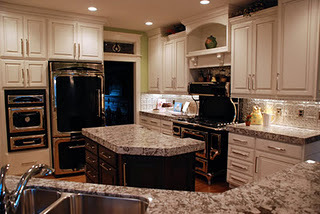 Hanstone Specchio White quartz in the kitchen and command center. I cannot wait to see this in my kitchen!!! Carrara Marble remnant for my baking center. Oh the wonderful things I will make here! I was at the house until about noon, so I'm not sure if the laundry room was going to be done today or tomorrow, or when our bathroom and the powder room bath have sinks yet. Stay tuned!